JP & I aspire to another Big Game, entitled “Bridge Over the River Wye”. Either 21st or 28th September. To be held in Burley Gate Village Hall (Hereford), usual set up of two tables, lunch provided, option of curry round my place afterwards. Please let us know by July 9th, so I can book the hall. As usual if we get 7+ people it will be £10 per head for hire of the hall and the lunch. We will then set in motion more cunning plans than Baldrick can count ! A few days off of painting, I’ve been watching fil-ums, planning the next AVBCW game with JP etc…. An epic film by David Lean, if you haven’t watched this, shame on you. Alec Guinness plays the stiff backed British Colonel who keeps his troops together but at the end realises his pride over building the bridge is betraying the Allied effort and betraying the Allied commandos lead by Bill Holden et al. Whilst a film of its age (post WW2 1960’s) it is fascinating in many levels and is ready to be plundered for waragames scenarios. Depression era hill-billy gangster film by Nick Cave. Hmmm, better than expected, not as action orientated as expected but on reflection, what I should have expected. Oh, and it has a shoot out over a bridge, with a venal anti-hero. A sub standard Alien homage – get it at cheap rates only. A few good ideas but, no, not really bothering with. Good ideas for an RPG scenario. Otherwise a B Movie. Why add the films I weatch to this blog ? because many good wargaming scenarios can be culled from films, and as well as the plots you can cull the characters, add in loads of puns, in jokes and so on and so forth. BoB Big Game 2013 06 22: Final Part ! So what were the results ? 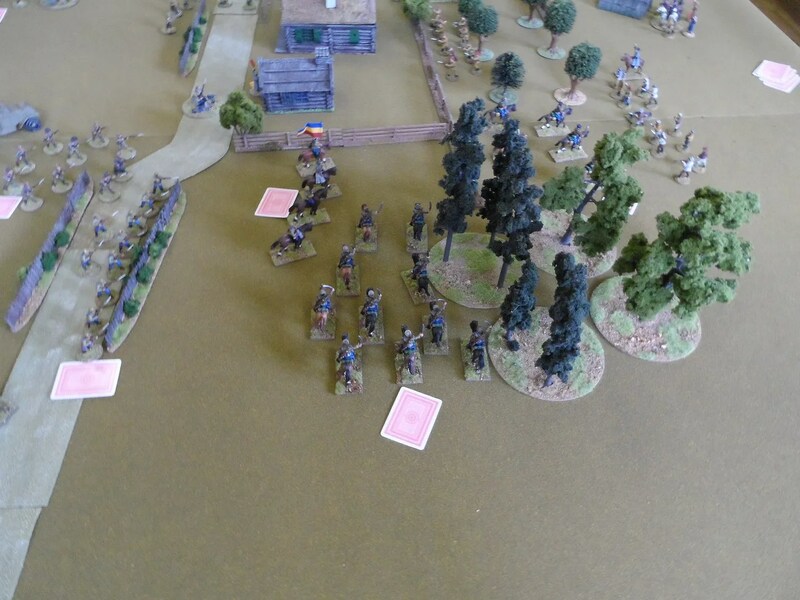 After an inconclusive artillery battle, the White Cossacks had charged and achieved a mixed bag of results. 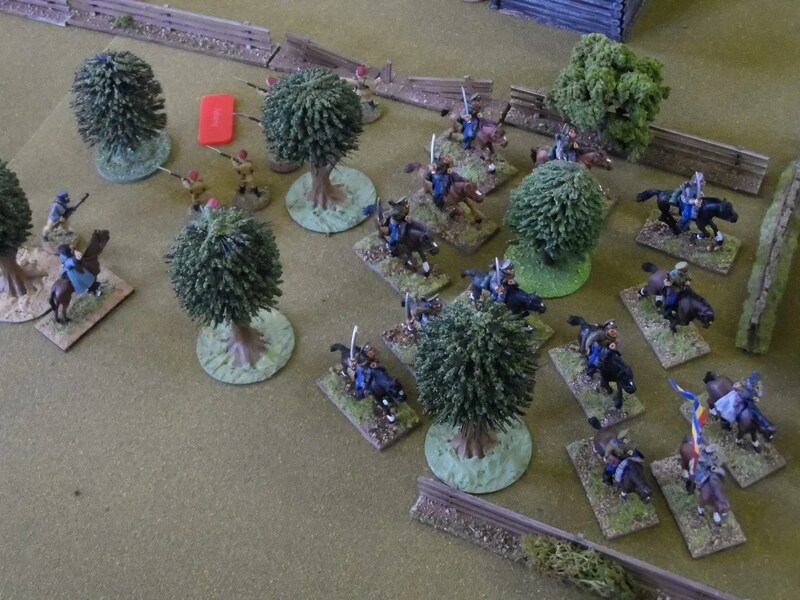 The Turks and Reds, had failed to push their forces into the village. A technical draw as neither side could hold the village. 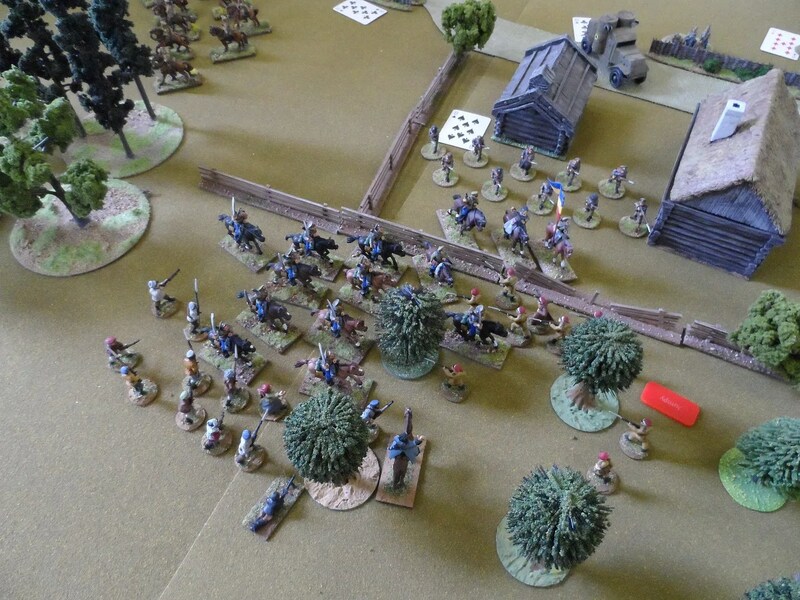 The outnumbered AFSR had held off the unholy alliance of germans, Reds and Don Cossacks, before their greater numbers came to bear. But by then their numbers were depleted to such an extent that they concluded they had lost the village. We need to add in some rules to improve the genre themes. Reliance on Cavalry as opposed to Tanks or A/Cs, changes the dynamics of how forces work. t’s got a higher rate of casualties, so therefore, an extra unit at least should be added / increase unit size. 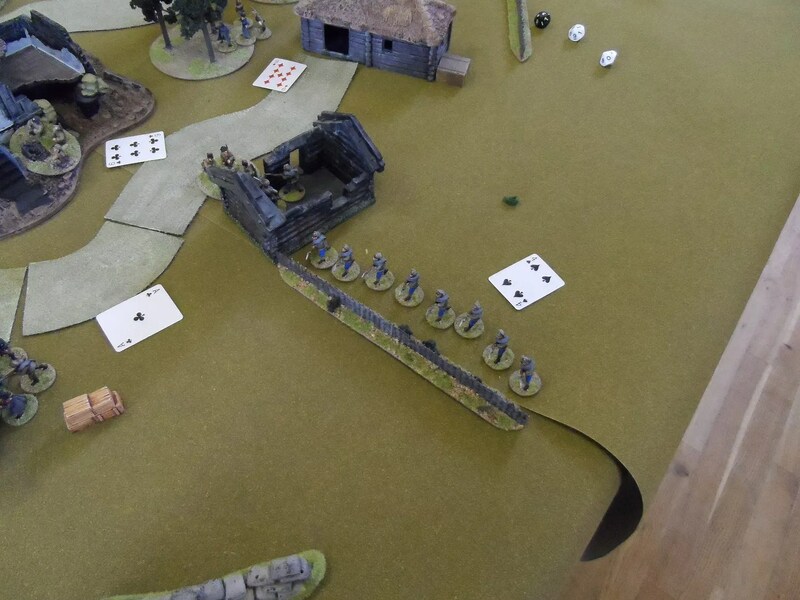 Meanwhile on Table 1, the Cossacks got to grips with their enemy. The Plastoons, defended the wall and saw off the Bolsheviks. 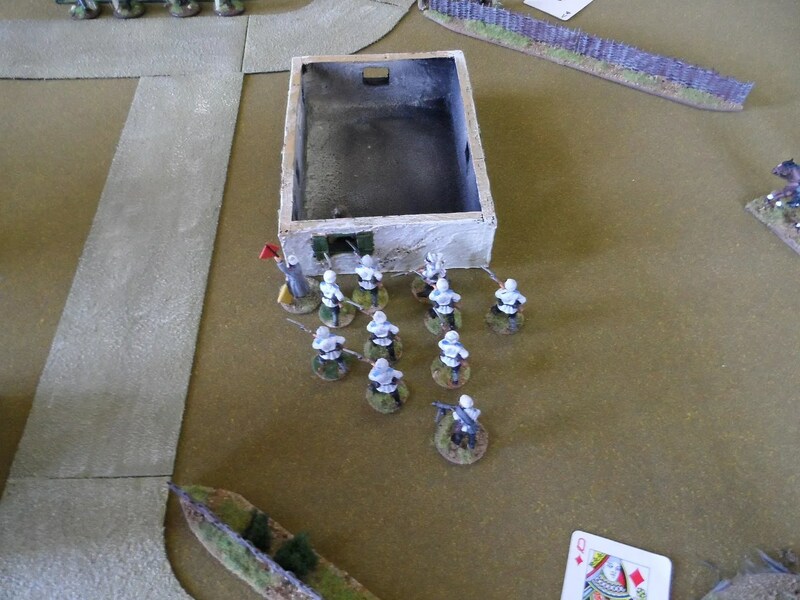 The firefight on Table 2 continued, with the Whites being whittled down. 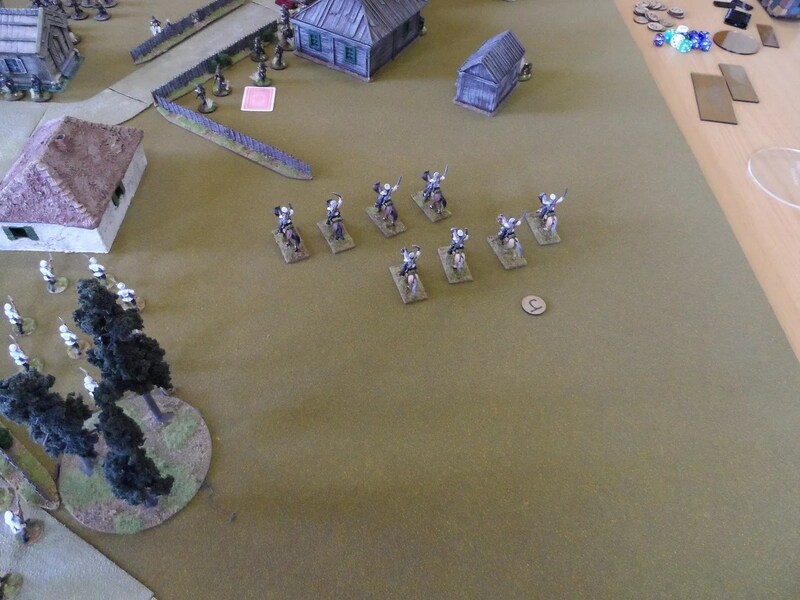 Cossack on Cossack action ! 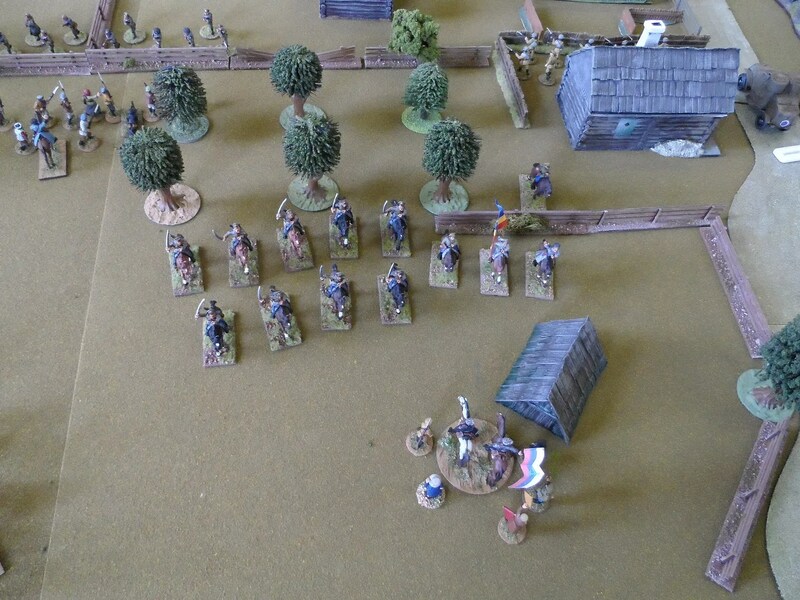 Rich’s Don Cossacks continued their attack on Mort’s command unit but got flank charged by Mort’s Cossack unit. 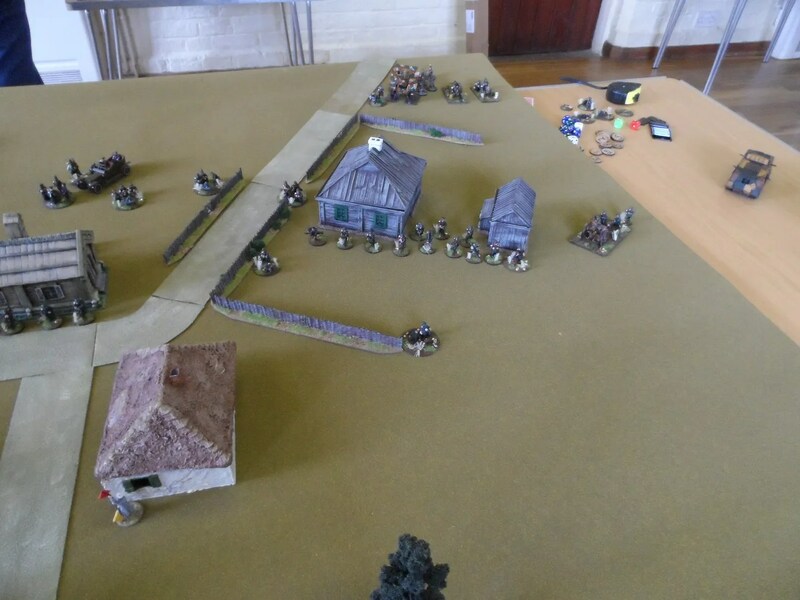 Table 2: The Don Cossacks ride through the partisans. This time the rules worked well in the combat round. Except, what do we do now ? 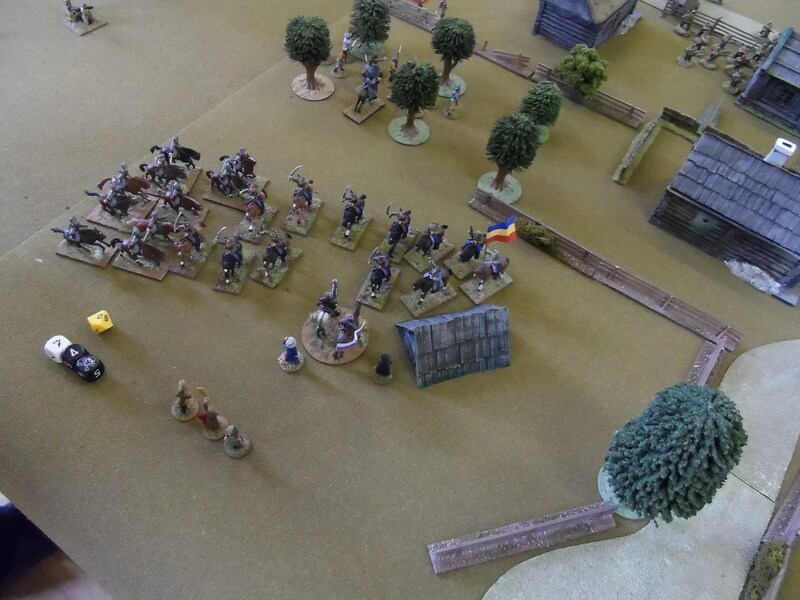 We had a long debate n how the Cossacks would respond. 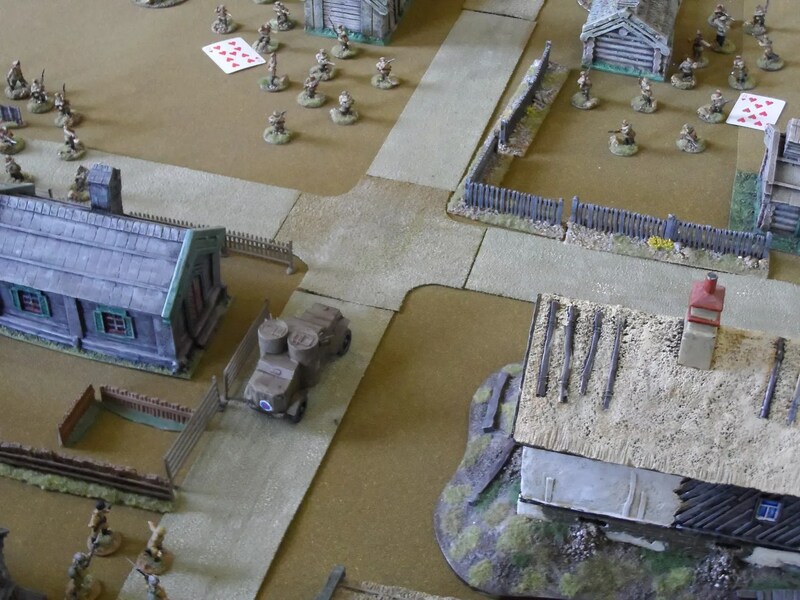 The Germans and Bolsheviks over-run the centre of the village – and see off the a/c. 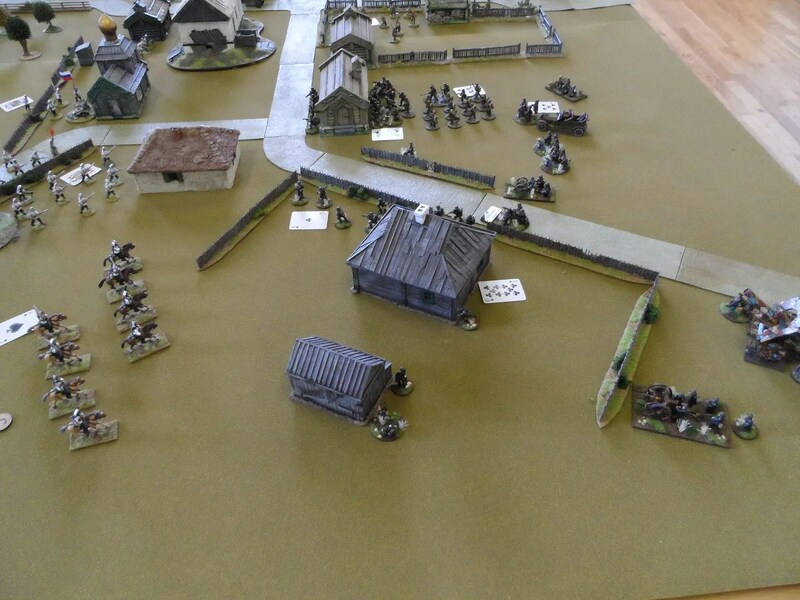 On the right flank, the AFSR and Germans have taken each other out leaving the second wave of Germans to move in. 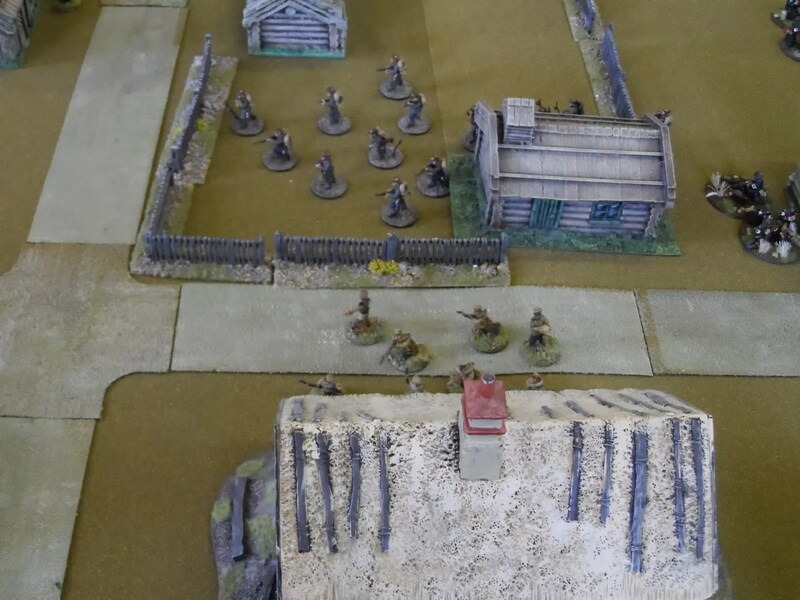 The Don Cossacks spot their target – Mort’s AFSR command unit ! 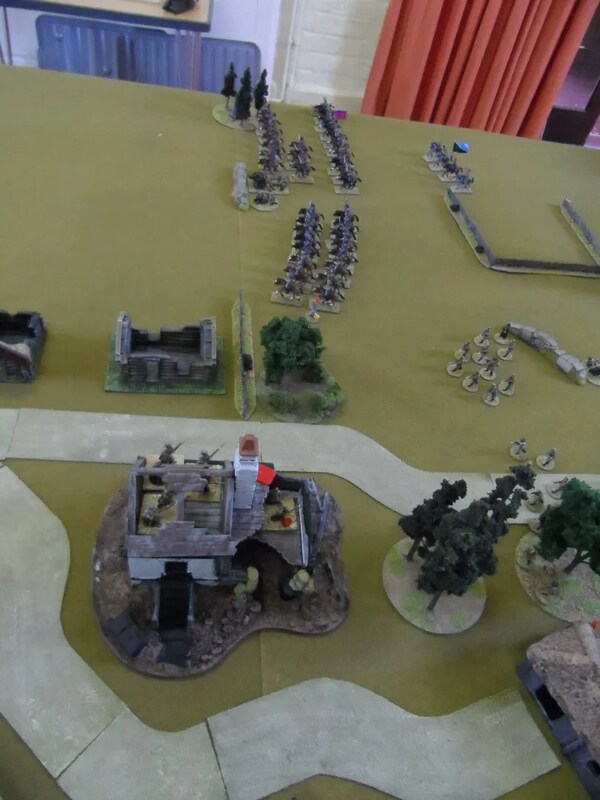 The Don Cossack artillery and John’s Bolshevik artillery pound Mort’s partizan unit in the orchard reducing the trees to matchwood and the partizans to pulp ! 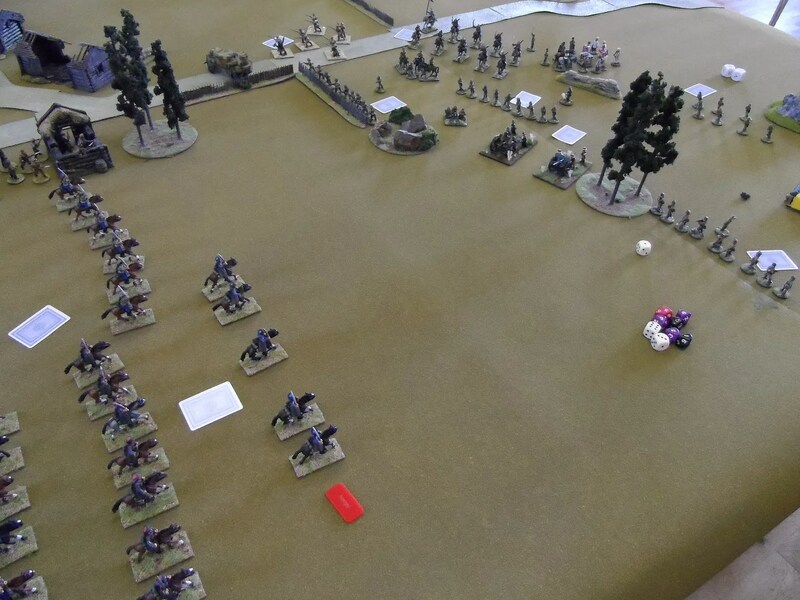 Whilst on Table 1, the players got bored of an artillery duel and the Cossacks bravely charged into the guns of the Turks ! 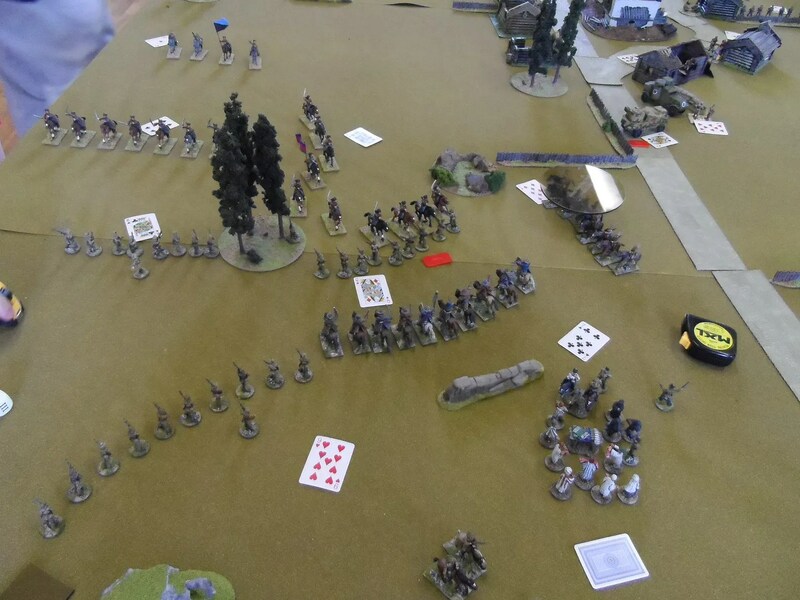 The two armies on Table 2 were converging on each other. My AFSR found the German sniper in the cottage ! 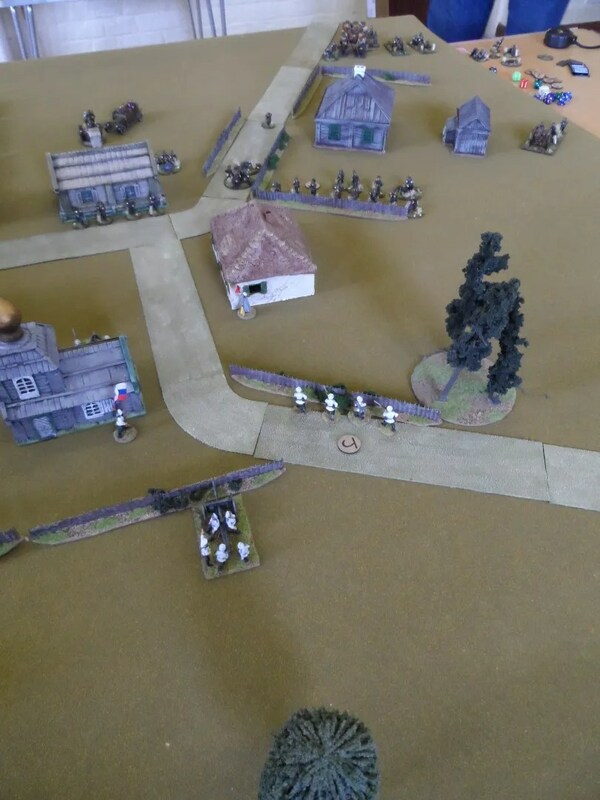 Table 1: The Cossacks continue their charge ! The Reds were taking no chances and advanced though. 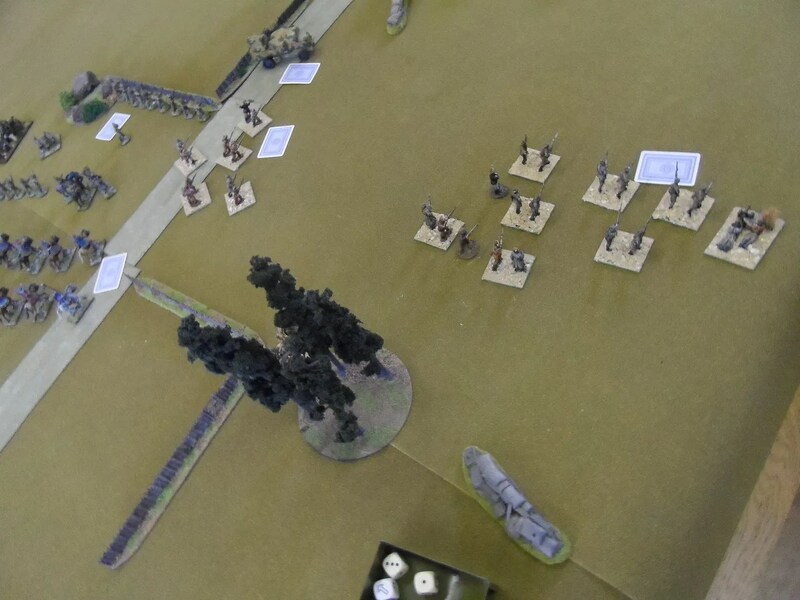 I did most of the scenery except for some fences by John Grant, and Mort, J Pasha provided some buildings and Byakhee Rich did the pinning on some figures and armoured cars. The roads were by Revolutionary Roads. 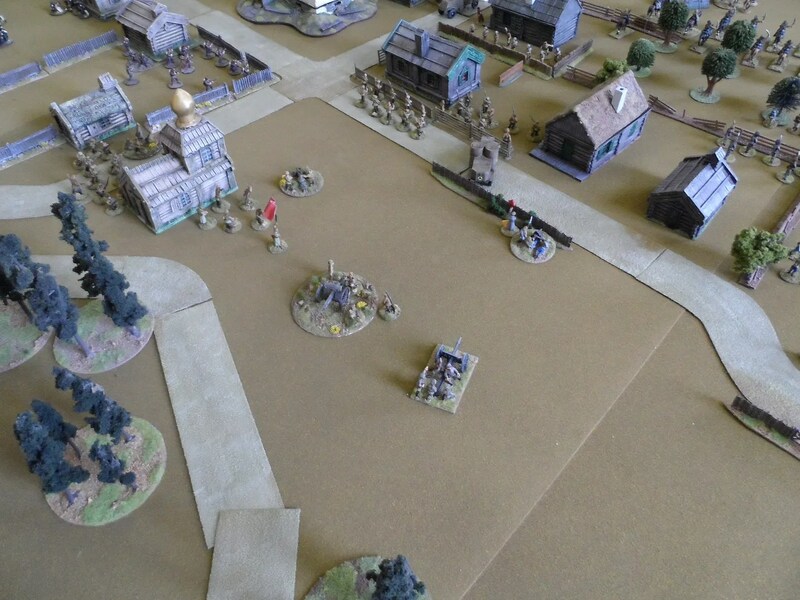 The mats were by Woodland Scenics from Antics.